Death is inevitable but it doesn’t have to be bad for the environment. 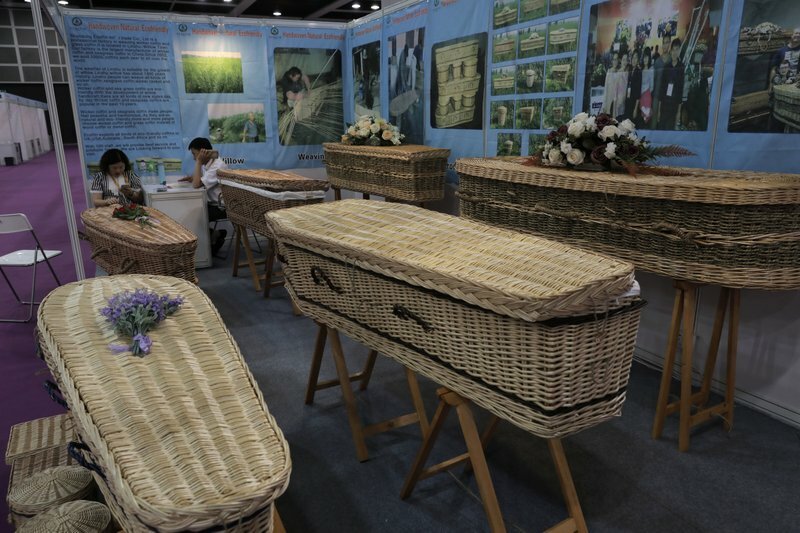 Caskets made of paper and wicker coffins on display at a recent Hong Kong funeral industry trade highlighted a trend toward “green burials” in an industry booming as Asia’s population rapidly ages. Chinese businessman Alex Sun’s company, Shandong Ecoffin International, makes wicker and seagrass coffins, which first became popular in the West and are now catching on in Asia. Basket-weaving dates to the Tang Dynasty (618-907 AD) in northeast China’s Shandong province, where Sun’s factory uses fast-growing willow reeds to make caskets that are an eco-friendly alternative to wood. “Eco funerals are a global trend,” said Sun. “European customers already know about this product, while Asian customers are also interested in it and would love to learn more,” he said. Interest is especially high in the Philippines, Malaysia and Vietnam as well as mainland China, he said. 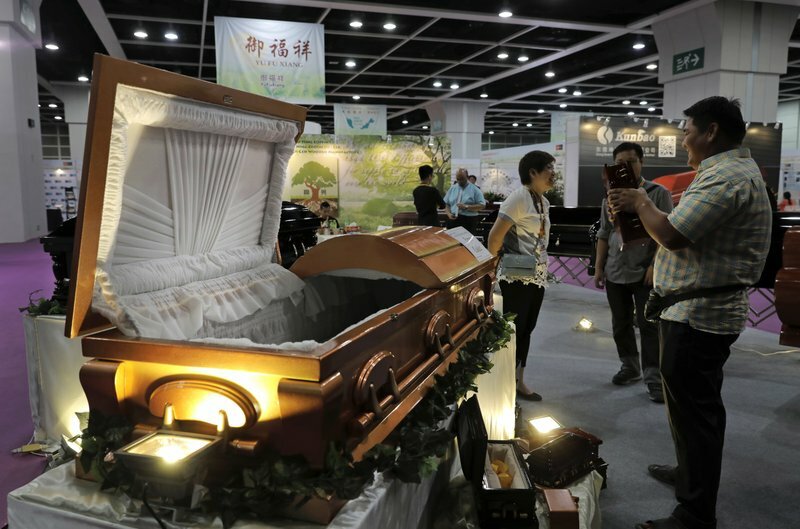 The mood was bright, not funereal, as coffin makers, morticians, funeral home operators and entrepreneurs converged on Hong Kong this week for the Asia Funeral and Cemetery Expo & Conference, a trade fair held every other year. Participants were pitching caskets for pets, Italian hearses, German cremators with high-tech filters and Japanese mobile embalming units. From China, Truthkobo Jewelry offered pendants made with ashes from deceased relatives or pets while Shenyang Roundfin was looking for international distributors for its autopsy tables, morgue fridges and body bags. The death industry is a lucrative market: Asia’s aging population is projected to hit 923 million by midcentury, according to the Asian Development Bank, putting the region on track to become the oldest in the world. The region’s funeral services market has been growing steadily and is now worth about $62.6 billion a year, with China accounting for nearly half of that, according to data from market research firm Euromonitor. “This is a very promising industry in China,” said Gloria Chuang, marketing director at Yu Fu Xiang Memorial Group, a Chinese funeral services company. But she said the industry in China needs to expand and to modernize. Most funeral home operators are family-run outfits selling one-size-fits all services. They’re not transparent about prices and other information for services and products like coffins and urns, she said. That’s partly because, as in many places, talk of death is taboo. Under Mao Zedong, who ruled China until his death in 1976, elaborate funerals, like many other customs, were officially condemned as feudal superstition and fell out of favor, though they persisted in many rural areas. Such rituals have seen a revival in recent years as the economy boomed, as the newly rich use lavish funeral rites to show off their social status and the accumulation of wealth. In 2013, the government banned Communist Party members from holding extravagant funerals for family members, seeking to curb waste, corruption and pomp. 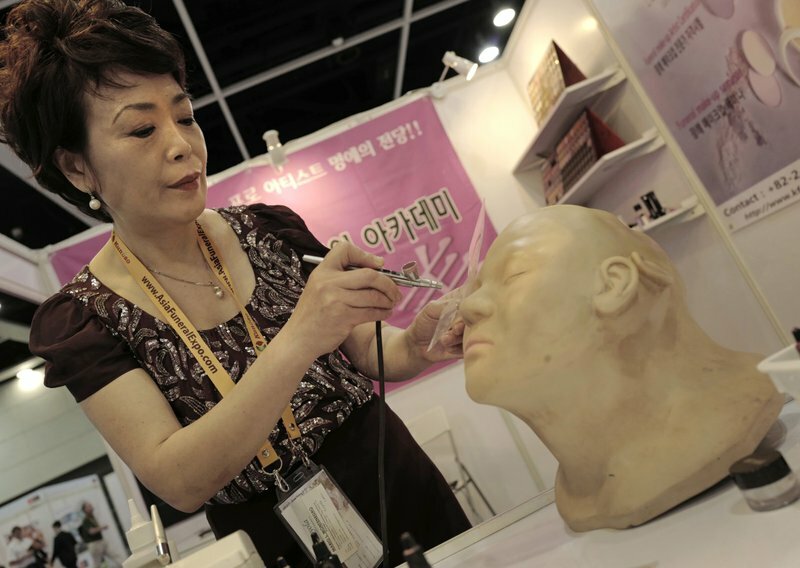 On the Hong Kong show floor, Lee Jong-lan, South Korea’s top funerary beautician, demonstrated her airbrushing technique, which she said is better than conventional makeup for covering up discolored or damaged skin on corpses. The Luen Hing Coffin Co.’s paper casket looked deceptively like a traditional one. It costs more because of a specialized manufacturing process for its honeycomb paper construction, but burns twice as fast as wood in a crematorium, saving funeral operators time and money, said General Manager Carol Chan. On display at Yu Fu Xiang’s booth were custom-designed cremation urns adorned with faces of the deceased and an ornate “elite longevity costume” resembling robes worn by Chinese emperors. Chuang said attitudes are changing and demand is growing for more personalized service as the children of the older generation become wealthier and more tech savvy. Cultural sensitivities regarding death are starting to ease, making it more acceptable to talk about preparing for the afterlife, she said at one of the fair’s seminars. Other speakers said that despite lingering resistance, there’s growing interest in online memorials that let family members upload pictures to the cloud and pay respects using their smartphones. The prospect of a lucrative investment opportunity even drew investors from outside the industry to the fair. Piyanuch Wattanasiritananwong and a friend came from Thailand, where they run a property business, after hearing about the show from a contact. “We want to know what opportunities there are in this industry because everybody dies,” she said. She pondered the possibility of starting a coffin business based on recycling — an elaborate outer shell is removed to be re-used while only a plain inner box is cremated with the body. “I don’t want people to spend a lot of money but still have a nice farewell,” she said.